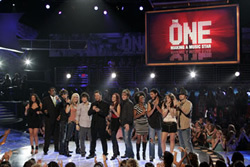 A group of 11 contestants, all attending a state-of-the-art music academy in Los Angeles, compete for a major recording contract. Contestants prepare for their weekly live performance by training with professional vocal coaches, choreographers, image consultants, and fitness trainers. Once they’ve performed, the home viewers vote for their favorites and the person with the fewest votes are sent packing. An American Idol-like reality series with the twist that viewers are shown what goes on behind-the scenes, in the performers’ common living space. My family and friends watch it every week.